Ganthet is a fictional character in the DC Comicsuniverse. He first appeared in the 1992 graphic novel Green Lantern: Ganthet's Tale (ISBN 1-56389-026-7), by Larry Niven and John Byrne. Origin: Born a Guardian of the Universe at the beginning of time. Ganthet is one of the Guardians of the Universe. However, where most of the Guardians are very stern 'by-the-book' characters, Ganthet has a personality that is more human-like, including displays of empathy and concern for an individual, instead of only thinking of the Green Lantern Corps. 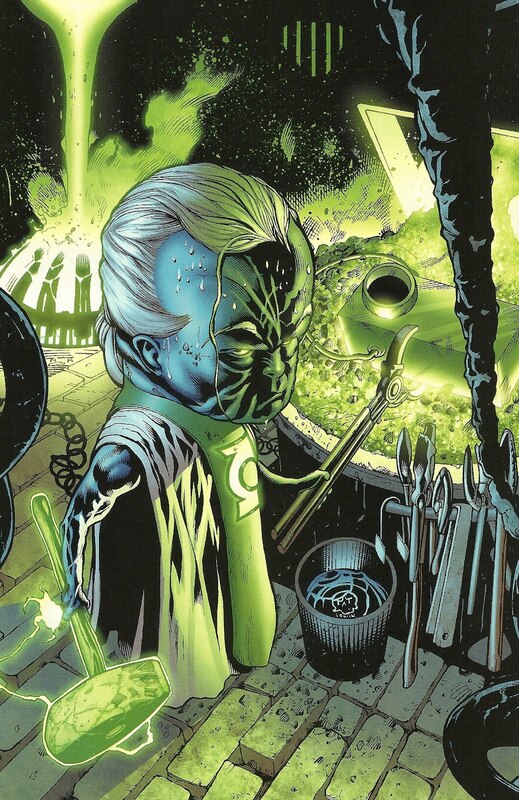 In various DC crossover limited series, Ganthet is shown as being part of the Quintessence, a group of near-omnipotent beings who oversee the results of what happens on Earth. Although he has been portrayed as looking alike to the other Guardians, Ganthet is often distinguished by tying his hair into a long ponytail, as the other male Guardians have shorter, unkempt hair. Hal Jordan is asked to help Ganthet battle a renegade Guardian, Dawlakispokpok (or Dawly, for short) who is attempting to use a time machine to change history. In the early era of the planet Oa, a scientist named Krona attempted to use a time-machine to see the beginning of time. In using his time-machine, Krona somehow 'bled' the universe of a billion years of life. Dawly is going to use his own time machine to thrust Krona to the end of time, preventing him from following through on his plan. In battling Dawly, however, it turns out that Dawly is responsible for the mishap that caused the universe to be 'born old'. When Dawly's family is brought before the Guardians, Ganthet shields Jordan's mind, allowing him to retain his memory of one of the biggest secrets of the Guardians. After the destruction of Coast City (in the "Reign of the Supermen" storyline), the subsequent insanity of Hal Jordan, and the destruction of the Central Power Battery, the Guardians decide to focus all of their remaining power into Ganthet. As such, he becomes the last Guardian. Ganthet creates a new Green Lantern ring from Jordan's ring (which was crushed by the former Green Lantern after murdering Sinestro) and goes to Earth. He appears before Kyle Rayner, hastily hands him the ring, muttering "You shall have to do". It is later revealed that Ganthet first went to Guy Gardner but Gardner turned him down. During Rayner's first few months as Green Lantern, Ganthet is less than satisfied with Rayner and attempts to take back the ring. Rayner eventually earns the respect of Ganthet by facing Parallax without his ring. When Rayner briefly becomes the godlike Ion, he possessed more power than Hal Jordan did as Parallax. Realizing that he can not continue as Ion without losing his humanity, Kyle travels to the recently restored Oa to recharge the Central Power Battery. By doing so, he creates a new set of Guardians, this time as small children (both male and female), with the intent that Ganthet will look after them and teach them how to be better Guardians than their predecessors. Rayner later travelled to the edge of the universe, where he learned about Parallax. Telling Ganthet what he found, the Guardian concluded that Parallax altered his memory following his escape, and told him the whole tale of Parallax's origin and imprisonment. Ganthet instructed Kyle to retrieve Hal Jordan's corpse, hoping to resurrect Jordan. Green Lantern Kilowog, under Parallax's influence, tried to kill Rayner, but Ganthet managed to stop him and sever Parallax's control over Kilowog, Guy Gardner, and John Stewart. Once Jordan and the The Spectre expelled Parallax's from Jordan's soul, the parasite bonded to Ganthet. but not before Ganthet sent a beacon of Oan energy to guide Hal Jordan's soul to his body. Resurrected, Hal Jordan led the other four Green Lanterns to defeat the Parallax possessed Ganthet, returning Parallax to the Central Battery on Oa. Following these events, all the Guardians are aged to adulthood and are just as cold and manipulative as before. The only change is that there are now female Guardians as well as male. Ganthet, of course still retains a sense of individuality amongst the Guardians, believing that they should retain their emotions. During the Sinestro Corps War, he and a female Guardian named Sayd are several times seen together, often speaking with Hal Jordan without the notice of the other Guardians. At other times, they both speak out against the methods and decisions of the other Guardians, such as the removal of the Blackest Night Prophecy from the Book of Oa, and the implementation of the 10 new laws. This last one leads to them being banished from the council for feeling emotion. 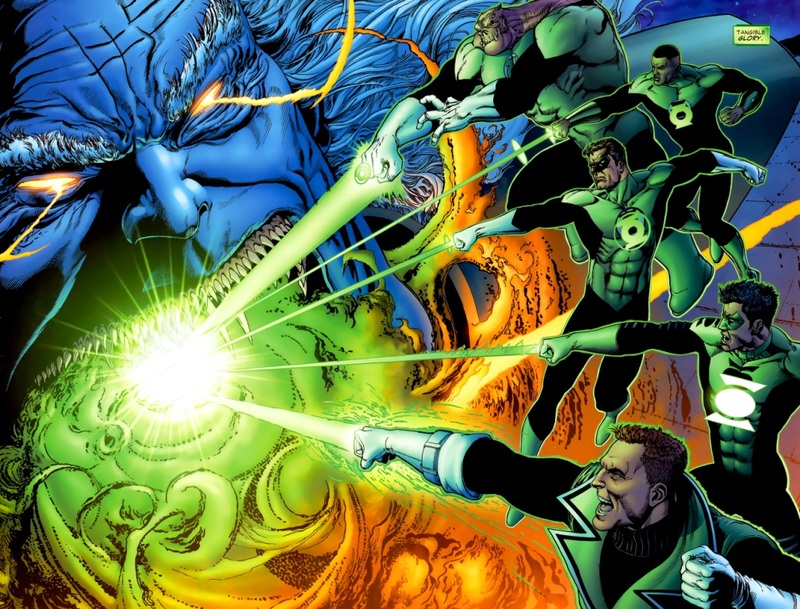 Just as Parallax (now back in his monster form) attacks the lanterns for freeing Kyle Rayner, Ganthet and the other guardian Sayd, arrive and draw Parallax into four separate lanterns (Hal, Kyle, John, and Guy's, respectively). As Ganthet explains, he and Sayd were kicked out of the Guardians of the Universe. Ganthet's final act as Guardian is to make Kyle a new power ring. He asks if Kyle is willing to downgrade himself to a normal Green lantern, which Kyle quickly agrees to. The four men then take their lanterns and hearing the Sinestro Corps oath, recite the Classic Green Lantern Oath, and depart to confront Sinestro's Corps. Ganthet and Sayd also explain to the four about the emotional energy spectrum created at the start of the universe that is seperated into 7 colors: green(willpower), yellow(fear), violet(love), red(hate), indigo(compassion), orange(greed), and blue(hope), each representing different forms of emotion, with green being the most center balanced of the energies. The further at one end an energy color is, the more wild its power is to control, leading to a corruptive influence over the user. 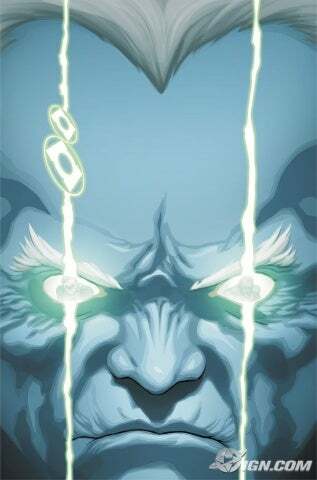 Ganthet also reveals that in the coming future, each color will have its own forces like the Lantern Corps, and these forces will fight against the others in a battle across the universe that will lead into the event known as "The Blackest Night", the worst of the hidden prophecies of the Book of Oa. At the end of the Sinestro War, Ganthet and Sayd are currently living on Odym, where they harness the emotional blue energy spectrum of hope and make plans to create another intergalactic police force in order to aid The Guardians and The Green Lantern Corps in their upcoming battle against "The Blackest Night" by creating Blue power rings and batteries. Both Guardians have evolved into two new beings, capable of bringing hope to others and each other, as they are also apparently romantically involved. After forging the Blue Central Power Battery, Ganthet and Sayd sought out a person from Space Sector 0001 who could spread hope. The person they found was Saint Walker of Pacredo. The Guardians of Hope explained what Saint Walker's ultimate mission and destiny would be if he joined the Blue Lanterns, and Saint Walker accepted. After learning that Sinestro was to be executed on Korugar, Ganthet dispatched Saint Walker to rescue Sinestro and bring him and Hal Jordan to Odym. During that time, Ganthet and Sayd discussed their mission with Brother Warth of Space Sector 0002, who Saint Walker had recommended. After three days of discussion, Warth accepted their offer, and Ganthet and Sayd placed a blue ring upon him. 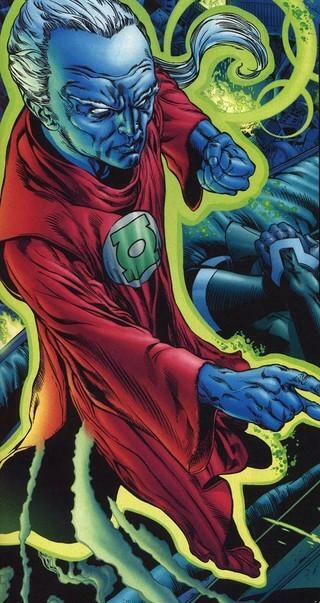 By this point, Walker had returned with Hal Jordan, but informed Ganthet that Sinestro had been kidnapped by Atrocitus and the Red Lantern Corps. Hal was initially dismayed to see the Blue Lanterns, thinking that Ganthet was trying to replace the Green Lanterns, but Ganthet assured Hal that they only wanted to help the Green Lanterns. Ganthet asked Hal to help the Blue Lanterns rescue Sinestro from Ysmault, reminding that while he hadn't always been clear with Hal, he had always been honest with him, something the Guardians of the Universe never had been. Hal agreed to help the Blue Lanterns rescue Sinestro. During the journey to Ysmault, Saint Walker revealed that after they rescued Sinestro, Ganthet intended to offer Hal Jordan a blue power ring and appoint him leader of the Blue Lantern Corps. However, Saint Walker had misinterpreted Ganthet's plans. While Ganthet wanted Hal to lead the Blue Lanterns, he wanted Hal to do so as a Green Lantern, believing his willpower could empower the whole of the Blue Lantern Corps, which cannot work without the green light of willpower, supplied by a Green Lantern Ring. Unfortunately, events on Ysmault had forced Saint Walker to place his Blue Lantern Ring on Hal to cure him of the Red Power Ring that had attached itself to Hal. Though it saved his life, Hal could not remove the Blue ring. Ganthet explained that Hal would have to use the ring before he could remove it. Hal soon departed to find someone who could help him. Ganthet had faith that Hal could remove the ring, but explained to Walker and Warth that he would have to do this on his own. He also instructed the Blue Lanterns to continue their recruitment and begin a search for the group who had harnessed the Indigo light, planning to build a united front of willpower, hope, and compassion to stand against the Black. After the Guardian's attempted apprehension of Agent Orange, Ganthet and the other Blue Lanterns are ambushed on their home planet of Odym by Agent Orange's Lantern Corps. The conflict with the Orange Lanterns only ended when Hal Jordan, Sinestro, Indigo and Carol Ferris came to Odym and assisted them against Larfleeze's energy constructs. Unknown to them, Agent Orange also stopped the attack because his true body back on Okaara was under attack from the newly risen Black Lantern Corps. Later, Ganthet and Sayd joined the leaders of the various Lantern Corps when Atrocitus and Larfleeze had been found and saved from a Black Lantern attack. Initially, there was tension in the group as Atrocitus sought to kill first Sinestro and later Ganthet and Sayd due to the Red Lantern's rage over the destruction of his Space Sector thousands of years ago. Eventually matters calmed down and he agreed to assist them as he believed the Black Lanterns were a threat to everyone. Later, Larfleeze proved to be equally difficult to enlist as his greed made him desire a Guardian of his won to which Sayd agreed to serve him if he helped them in the Blackest Night, much to Ganthet's disapproval. Ganthet accompanied the others in following the trail of the Black Lantern Central Power Battery by first going to Ryut and eventually Coast City on Earth where the leader of the Black Lantern Corps; Nekron had risen. 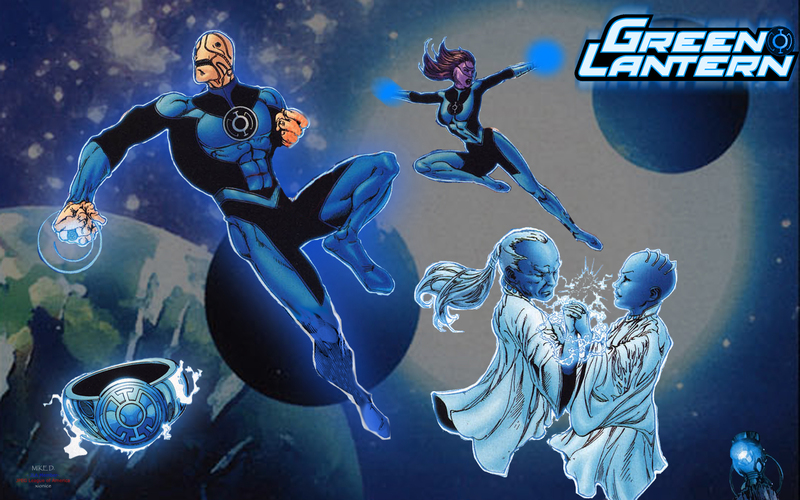 Ganthet aided the Lantern Corps as well as the superheroes of Earth against their undead foes and succeeded in destroying the rogue corrupted Guardian Scar after which the various lights of the Emotional Spectrum were united against the Black Lantern Central Power Battery. However, for some reason, this only fed the dark construct which spewed a new Black Power Ring and renimated Batman. His revival formed an emotional connection with various resurrected superheroes through which Nekron forced Black Power Ring's onto them and forcibly converting them into Black Lanterns whereupon he urged his new minions to move forward in order to wage war against the light. In responce to this, Ganthet activated a hidden code in the power rings which forcibly duplicated them, and sent these duplicates off to find other bearers. Presumably this code is different from the other more common method of duplication, which was in fact a temporary construct intended to deputize an individual for 24 hours. With one of the Green Rings, Ganthet became a deputy Green Lantern. With the end of the Blackest Night, Ganthet along with Guy Gardner had secret communiques with the Red Lantern leader Atrocitus who told them to come to Ysmault. There, Ganthet explained his mysterious goals to the Red Lantern with the three agreeing to a form of pact between them. With that complete, Ganthet returned to Oa in order to make the ultimate sacrifice which was resigning himself from the status as Guardian of the Universe of any of the Corps and instead become devoted to becoming a Green Lantern. He explained this decision to his six surviving Oans that they had distanced themselves too far from emotion and that Ganthet desired to help people directly rather than guide billions from afar. Though they urged him to remain as they required him now more then ever as there were so few of them left, they ultimately respected his wish. Following that, Ganthet journeyed directly into The Foundry where he forged his own Green Lantern Power Ring and Power Battery thus becoming the official Green Lantern of Space Sector 0000. With that complete, he joined the rest of the Green Lantern Corps during the reconstruction efforts on Oa. Notable enough, his new Power Battery lacks the ordinary, rounder design, and looks much similar to the squared, older ones once wielded by the Manhunters and the Halla's. One of his first acts as a Lantern was to investigate the disappearance of the Green lantern Stel, who had recently returned to his homeworld of Grenda, and John Stewart, who had first gone to look for him. Upon recruiting Kyle Rayner and Soranik Natu to aid him, they arrived on Grenda to find its people missing, but that a force of Alpha Lanterns were present along with the Cyborg Superman. What was more, there were additional Alpha Lanterns present who had been forcably converted under the Cyborgs' orders. They discovered and rescued John Stewart from the conversion process, though Ganthet was captured int he escape as he had stayed behind the fight Henshaw. 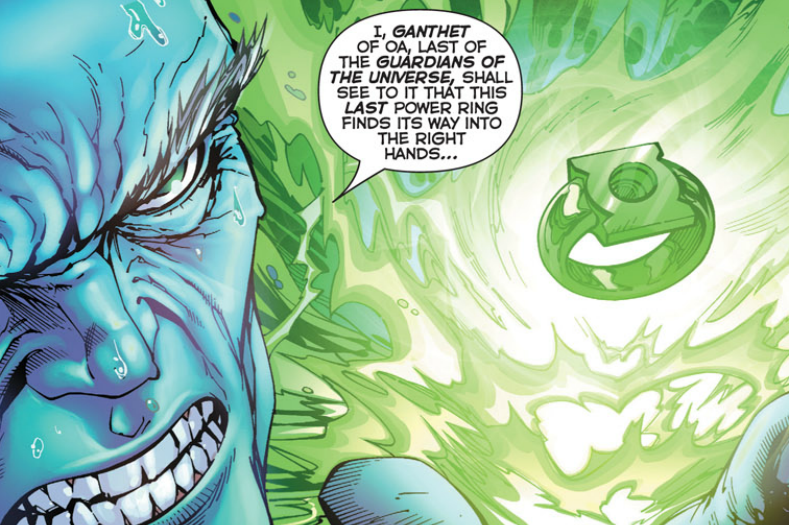 Henshaw, not able to defeat Ganthet, revealed that he had converted himself into an Alpha, and proceeded to drain Ganthet of his power ring's energy. With the Guardian captured, he informed the immortal that he wishes him to return him, Henshaw, to a mortal state, as he had been told that the Guardians can convert an Alpha back to flesh and bone. Ganthet protests, stating that he had left the Guardians before they created the Alpha Corps., and so he had not knowledge of how to restore them. Henshaw orders one of the Alphas to blow his own head off, prompting Ganthet to experiment on Alphas until he can get the process correct. He begins work, noting how very precise everything is, though Henshaw is not sympathetic, telling him to work faster. After nearly the patient almost dies, Henshaw rips out the Alpha's organic heart, killing it, and telling Ganthet to do better next time. To Ganthet's bewilderment, he feels an ache in his chest he does not recognise, and begins to cry, Henshaw telling him that the ache he feels is grief, one of the many emotions that the Guardians have felt fit to ignore for eons. When Henshaw is distracted by the uprising of the Grendan people, Ganthet takes the opportunity to recharge his ring via an Alpha Battery, and joins the fight. After Henshaws defeat, Ganthet is made an Honour Guardsman by the Guardians of the Universe. About the time that Krona possessed the Guardians with the entities and re-introduced Parallax to the Central Power Battery, Ganthet was to be found with Kyle Rayner and John Stewart after travelling to Qward. Each of them felt parallax attempt to control their minds, but resisted, Ganthet's ring exploding and taking off his hand. Not soon after they were intercepted by a task force of Green lanterns possessed by Krona. Giving Kyle and John time to get away, Ganthet used his Guardian-level powers to hold off the lanterns until the four earth lanterns returned bearing the rings of the New Guardians, who had previously been sealed within the Book of the Black. Ganthet lost no time in informing Hal Jordan of the foolishness of his decision, but got no farther when the planet Green lantern, Mogo, appeared above, and blasted Ganthet into unconsciousness with a giganctic beam. Ganthet was taken along with Guy Gardner and Hal Jordan to the Citadel of the Guardians, where Ganthet was tied down as Krona attempted to force the Earth Lanterns' evolution through Maltusian evolutionary tapestries. At this point however, John Stewart destroyed Mogo using Black Lantern energy residing in Mogo's core, sending a psychic shock wave through Krona, Ganthet, the Guardians, and the entire Corps., allowing Hal and Guy to escape, taking Ganthet along with them. Once they had all recovered from the shock of Mogo's last scream, Ganthet expressed regret over the loss of Mogo, and told the Earth Lanterns to crack the shell of the Central Power Battery in order to release parallax, and free the Corps. Krona and the Guardians arrived too late to stop this, and Ganthet, along with the Corps, surged forward to engage in battle. During the battle, Ganthet battled against Krona himself but was defeated. It was only the actions of Hal Jordan who somehow managed to override the built-in safeties of the Power Ring that led to Krona being slain. This act also helped free his Oan kin from the possession of the Entities and bring about the end of the War of The Green Lanterns. In the aftermath, Ganthet decided to complete his pact with Atrocitus and entered into the Crypt of the Green Lanterns in order to send Krona's dead body to Ysmault. When he completed this act, he was confronted by the Guardians and he defended his actions though his Oan kin were not concerned by this action. Instead, they used their collective power on Ganthet and forcibly purged him of his emotion. The now emotionless and cold Ganthet stated that he had decided originally to experience emotions in order to provide a report on them to his fellow Guardians. Now free of it, he stated that the Green Lantern Corps was ultimately a failure and that the Third Army needed to be unleashed. At some point during this time, Kyle Rayner arrived on Oa where he asked Ganthet's help as Power Rings from the different Corps had selected him for some unknown reason. This drew an an angry interest of the Guardians who decided to study Rayner and force the Power Rings from him. Rayner was shocked to see what the Oans had done to Ganthet who he had seen as a father figure. At this point, Kyle was overwhelmed by the collective power of the Rings and wielded the entire Emotional Spectrum for a moment before passing out. Ganthet and his kind later battled an incarnation of the New Guardians that had followed Kyle. The combined Guardians easily defeated the New Guardians at which point their Citadel came under attack from Agent Orange who was accompanied by Sayd. A saddened Sayd lamented on what the Oans had done to Ganthet but the now cold Guardian refused her words. He later shot an energy blast that knocked her to the ground before she could take Rayner to safety. At this point, Ganthet offered Rayner a choice since he sensed the embers of the combined Emotional Spectrum in Kyle. He asked Kyle to join him to discover the reason for this and that any refusal would see him being labelled a renegade. Kyle stated that he always saw Ganthet as a father but knocked him backwards before joining Sayd along with the New Guardians who teleported away from Oa. During the events of the new 52 it is revealed that to compensate for the recent guardian deaths, the other Guardian capture and brainwash Ganthet to strip him of his emotions so that he can become one of them again. It is also revealed that the procedure combined with Ganthet's experiences as a Green Lantern has rooted out the flaws in their group and believes that the time has come to replace the Green Lanterns with the third army. However, Sayd has implied that Ganthet can be restored to his former self, but has not elaborated as to how this could happen. When Sayd was brutally killed by the third army Ganthet appeared to express sadness at her loss, but dismissed it as nothing. 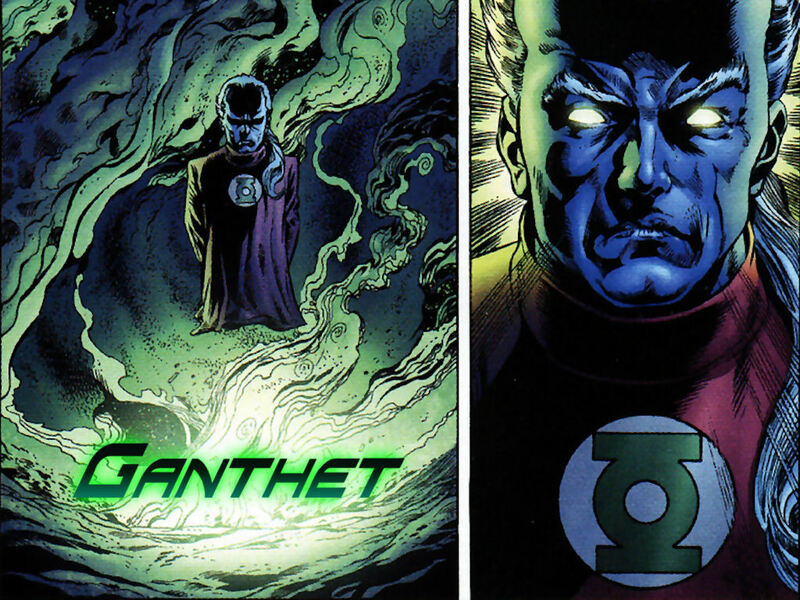 Blue Energy Manipulation: Once possessing the power to generate and manipulate the green energy of the emotional concept of willpower, Ganthet has evolved to the spectrum of the emotional concept of Hope. He now generates and manipulates the blue energy of that concept. Green Lantern Power Ring (formerly): Originally during the Blackest Night, he wielded a copy of Hal Jordan's Power Ring as a deputy Lantern when he activated the procedure to have an individual appointed to each Lantern Corps as a deputy member. At the beginning of the Revolt of the Alpha Lanterns storyline, Ganthet officially creates his own Green Lantern Power Ring when he becomes an official member. The ring was later destroyed during the War of the Green Lanterns storyline due to a power overload and was never replaced.